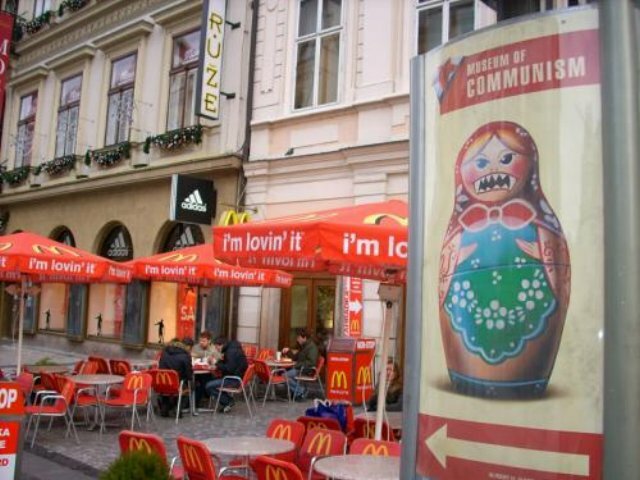 The doll reads "Museum of Communism" on the back, as the concept for this Russian doll was derived from a poster advertising the Museum of Communism in Prague, Czech Republic. Not the first time, and certainly won't be the last time, Matryoshka is used as a vehicle of political satire. We only hope that Vladimir Putin pays attention and the past does not repeat itself so quickly. Hand painted and decoupaged at the Golden Cockerel workshop in St. Petersburg, Russia.